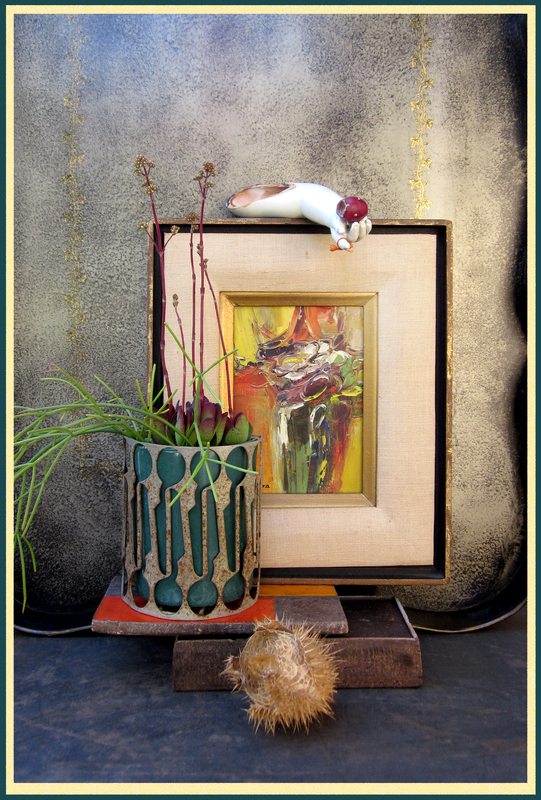 The “piece of art” is a framed abstract painting from the flea market; the “plant”, two succulents from the Rancho’s front yard; the “pot”, a ’50s-era dark green ceramic half-cylinder with a rusted metal surround that features shapely cut-outs. Additional elements include the lid and base of a glazed ceramic box, a spiky seed pod found on Mt. Rubidoux, and a large aged steel tray as backdrop. Ginny’s blog, artwork, and photographs, are colorful, but with a boho-religious-Latino vibe, that sometimes verges on the dark, so the items I chose for the still life reflect that by being both bright and dark, rich and saturated. Complicated … like you’d expect from a Gypsy Girl Grounded. Thanks for the inspiration, Ginny, I hope you approve of the still life you inspired. Be sure and check Ginny’s blog here to see her still life based on the list of ingredients she suggested … Inspiration: it’s a two-lane highway! Oh careful! You could have still-life challenges coming in from all over the blog-o-sphere! What fun…. Ha! I can think of worse ways to spend my time … this was fun! A White Punks on Dope still life! Fabulous. Wow, that is so awesome Reubin! Made me almost cry! I love it and it has inspired me to do one of my own! The textures and surfaces and pot and and color pallet and the reminder string on the finger…super cool! It will give me some inspiration of my own during this No.Cal. January-like weather. Might have to a lttle dismembering…glad you got the “What do you want from life?” reference. Thanks, Ginny, I’m glad you enjoyed my fun little exercise in Gypsy Girl encapsulation … btw: the string on the finger was pre-existing … the advertising piece the baby arm belonged to had a slogan like: “Remember Acme spark plugs” or some such. I tried to remove the string but it’s glued on. So there it is! Hi Reuben! May I use a couple of your photographs on my blog? With photo/artist credits, of course! I did a Reuben inspired still life yesterday. Aboslutely! I can’t wait to see what you came up with. i get the feeling your life is never still! Haha… It’s not a still life if I’ve got hold of an idea …. like this one. Just had to do it! Thanks for the fun and the link! I think that you should teach a still-life workshop at RR! I could come down and help with the camera/tech stuff! I can’t post comments to my own blog right now, so thanks again! I hope some of your other readers do their own interpretation, it would be cool to see what others come up with! that still life is gasp worthy, endlessly appealing to me — would hang a 18 x 24 or that on my wall in a second. Cool. Cool.. will let you guys know when (and where) you can get a print.